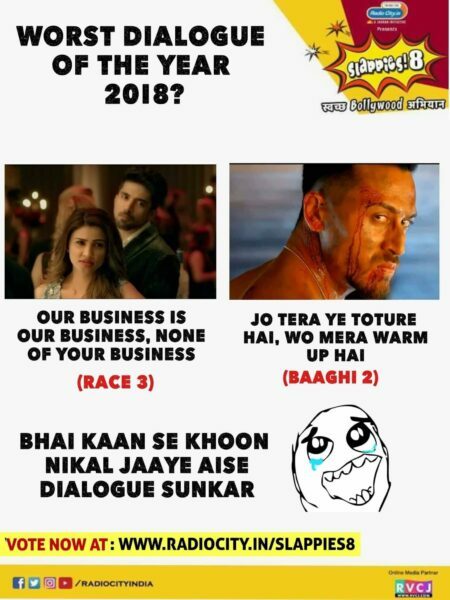 It has been quite an interesting year for Bollywood, don’t you think? In some ways, Bollywood surpassed itself in 2018, and in some ways, our favourite celebs have let us down. For instance, it has been a win win situation, as far as content is concerned. As a matter of fact, masala movies like Zero failed at the box office, whereas meaningful films like October and Andhadhun touched our hearts. But then again, you rarely get an opportunity to express what you truly felt about the performances you witnessed last year. What if we told you that there was a way you could? Like last year, Radio City and RVCJ is bringing to you Slappies 8: Swachha Bollywood Abhiyaan – a live poll, where you could vote in a number of categories, all related to Bollywood. Worst bollywood jodi. Worst debut. 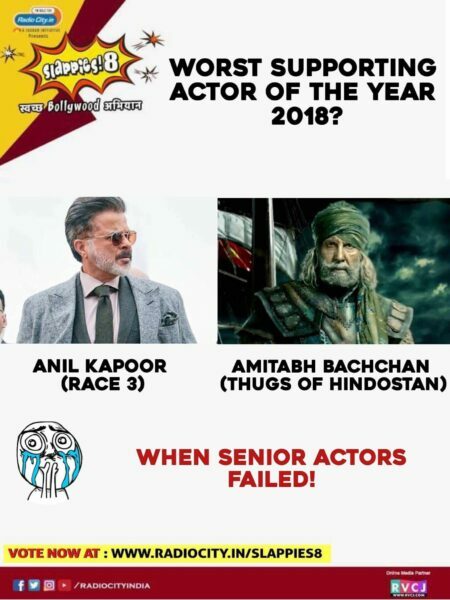 Worst actor. Worst singer. Worst dialogue. The list is endless. This could be your one time opportunity to vent all your frustration and anger for Bollywood actors who failed you and tell them what you really think of them. The voting lines are now open, and you could go and slap your votes right now! Click on this link to register your vote! Go on, what are you waiting for? Every vote counts! The post Swachha Bollywood Abhiyaan: Poll For The Worst Bollywood Performances Starts Now appeared first on RVCJ Media.